The Golden State Warriors have been playing thus far to start the 2015-16 NBA season, all without their head coach who helped them in winning a championship last season. 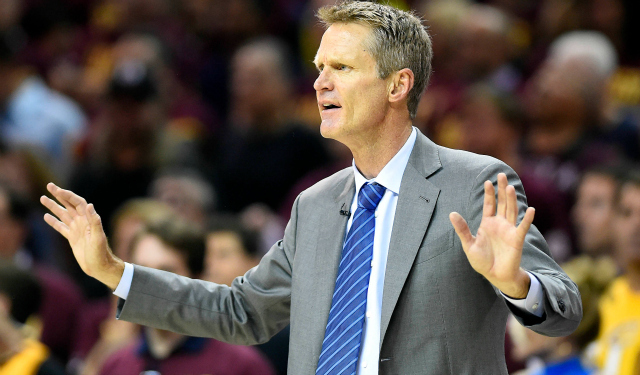 Steve Kerr has been recovering from a spinal fluid leak, and the team has given no timetable for his return. In fact, one Warriors player told ESPN's J.A. Adande during the Wednesday night broadcast of the Warriors-Clippers game that Kerr may not be back until the All-Star break in February. "We had a chance to catch up with coach Kerr before the game and he still seemed very fatigued, told us he's dealing with headaches, is still heavily medicated," ESPN's J.A. Adande reported during the Warriors' game against the Los Angeles Clippers on Wednesday. "Yet [he] did get a chance to talk to the team after its 50-point victory over the Memphis Grizzlies the other day. He joked with them that, 'It's obvious you guys need me.' Now, they took that as a good sign his sense of humor was back. But he's still far away. In fact, one player told me they wouldn't be surprised if it takes him until after the All-Star break to return. And they're prepared to go that long without him." In the meantime, 35-year-old assistant Luke Walton will serve as the interim coach. This is definitely not something that was planned, but it could work out well for Walton, who could get some head coaching opportunities if he does a well enough job.